Arguably, one good explanation for why people reject climate science is that it scares them. Today Anthony Watts, who runs the climate conspiracy blog WUWT, said he was scared by air-conditioners, and Oklahoma City. He also said he was scared of rising seas. He often rejects the fact that seas will rise as ice melts. I'd say that being scared is probably one of the main reasons for deniers denying. It fits with the research on the conservative brain. It's been shown already that free market ideology is a predictor of climate science denial. Pair this with the research on the conservative brain and it is apparent that emotions are more likely to get in the way of reason for people who are politically conservative than for others. In particular, fear rather than reason is probably what drives a lot of people to reject climate science. Anthony Watts's commentary today (archived here) supports that notion. His headline was: 'Another climate scare story about New York City; climate models say it will ‘resemble Oklahoma City today’'. If you read the article, the story isn't scary. It's about how climate change will affect the number of days people in different cities in the USA will need to use artificial heating and cooling in their homes and offices. Rising seas is a justifiable reason to be fearful. Humans don't live well under water. And rising sea level will mean a lot of property destruction as well as loss of human lives. That is probably why Anthony doesn't believe that when ice melts the seas will rise. He has written many articles in which he rejects sea level projections. He goes to some lengths to explain that if he extrapolates past sea level rise to the future, in a straight line, it would take anything from centuries to millenia for New York city to be inundated. Anthony doesn't deny that ice won't melt in a linear fashion. He simply ignores the reality. He is scared of it. That makes him a good sucker for Bob Altemeyer's "scumbucket" - the Right Wing Authoritarian leader. And it may go part way to explaining why Anthony is a fan of people like Christopher Monckton, who is one of the nuttier conspiracy theorists in deniersville, along with Tim Ball (who appears frequently on a generalist conspiracy show). One who has a devoted following by a sub-group of WUWT readers. Anthony denies science not because of the science, but because he's scared that it will mean he'll have to pay tax. 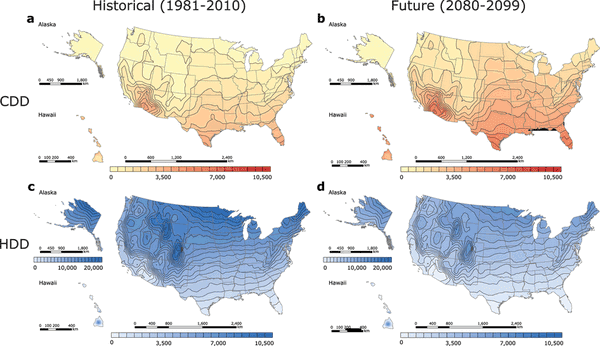 Figure 1: Maps of interpolated historical (1981–2010) and future (2080–2099) US CDD and HDD, calculated from NOAA’s 30-year daily degree-day normals and CMIP5 RCP8.5 climate model output, respectively. By the end of the century, station median HDD + CDD will be reduced in the contiguous US, decreasing in the North and increasing in the South. Under the unmitigated RCP8.5 scenario, by the end of this century, in terms of HDD and CDD values considered separately, future New York, NY, is anticipated to become more like present Oklahoma City, OK; Denver, CO, becomes more like Raleigh, NC, and Seattle, WA, becomes more like San Jose, CA. It seems that the best place to live, from the point of view of hot and cold days, will be San Fransisco. You'd think this would have placated Anthony, wouldn't you, seeing he lives not too far from there. Greg Woods points out that seas will rise, affecting New York city. I gather he wanted the authors to study sea level, not temperature change. And not to be terribly cynical about their ‘analysis’, but what happened to sea level rises? Wouldn’t New York more resemble Venice than OK City? Dale R. McIntyre tells New Yorkers not to be scared. Oklahoma City has a nice climate. Funny, I grew up in a little town just a few miles from Oklahoma City. And I’ve been to New York City many times. If these modelers are correct, which is very much in doubt, New Yorkers will find that their climate is much improved as it approaches that of Oklahoma City as it is today. Winters will be much, much milder while summers won’t be that much worse. Superb work by the author, more modelling analysis so garbage in garbage out. But she is cluey enough to know where her next pay cheque is coming from. Yes, the con artists can stoop lower than anyone could possibly have imagined. Betcha Ken Caldeira can publish another Armageddon ‘study’ with an Elementary School student that has been perverted on Global Warming via Common Crap, (er Core). How many people read this drivel and believe it? I would like to believe that most people understand that politics are controlling the media coverage and that the stories….are well…just stories and we’re not on an apocalyptic journey to doom because of CO2. Obviously there are some that want to believe it. I also think there are many who don’t believe CAGW but wouldn’t say so for fear of being ostracized. The alarmists are trying to outdo religion for shaming but they’re dreaming if they think they are in the same class. My apologies if I offend any believers with my frankness. “….achieve a comfort level of 65 degrees Fahrenheit…” Isn’t that a little cold? I thought 72 F – 22 C was the comfort level??? Forgiveable on a general interest blog of some kind but sheesh! Sou, you forgot one other thing that scares Anthony: his own shadow! I am one of Anthony's proteges (until he threw me off of his blog), Steven Goddard. That's brilliant, because it is absolutely, perfectly accurate. This somehow escaped my attention (Goddard lying himself to the media forefront), but that thread where Curry actually defends the lying, is wow. Yet again. I don't know which of the two is crazier. "Anthony denies science not because of the science, but because he's scared that it will mean he'll have to pay tax." That's not fair: Anthony is perfectly happy to pay the 'right' kind of tax. When do you ever see a climate change denier complain about his tax dollars being given away as a "fossil fuel industry subsidy"
I was going to say that the CONservatives are probably going to win this thing over here because I've been listening to MSM but hey look, give 'em 'ell go Bernie go! With assistance provided by predator Wall Street banker (looters), the Waltons became the world's wealthiest family by decimating U.S. and world physical economies, applying ferocious austerity, flat lining wages and thus lowering living standards. The Waltons are now using their enormous leverage to carefully construct their own tightly controlled family banking empire. They bankroll the vast neo-conservative political network. Example, John Walton, who is worth more than $25 billion, was the largest single individual contributor to Jeb Bush in Florida. They are the principal financial force in the effort to privatize the public school system, through school vouchers, which wrecked public education. Essentially creating a Walton School~Mart. I voted straight Democrat for the first time during the midterm elections mostly just to spite Mr Godd (progressives are eeeeevil ad nauseum)... By the time I got back and turned on the radio in the truck the Reflubitcans had won everything. 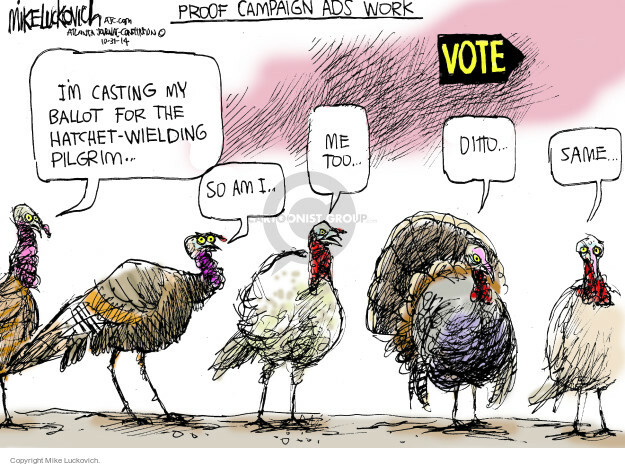 Campaign ads work, dummies. I suspect what Anthony is really afraid of is being an unknown, out of the public's eye, of being ignored. He's insecure. He knows he doesn't have what it takes to even do high school math, is cowed by scientists and people who do have what it takes, which makes him angry, resentful, and prone to striking out, but only from the safety of his blog and not in person, where he keeps completely silent when surrounded by scientists, or behaves decently when having dinner. Of course, that makes him a coward, which he recognizes on some level which is why he, from the safety of his blog, goes after people who point out his errors but don't use their real names. (it's okay if you use a pseudonym to go after those big bad scientists though). It is sort of like those tv preachers who rail against homosexuality or immorality, but are then found to be having one-night stands with other men or with women in hotel rooms wherever they travel to preach the good word. They speak out strongly and express their disgust because it helps them put a distance between their actions and their perception of who they are: they're a good person, only bad people commit these acts and don't feel guilt, therefore I'm not a bad person as I feel guilt, and if I speak out strongly against these acts now, I won't fall into temptation the next time (until they fall into temptation the next time). So Tony lashes out at his "enemies" (i.e. anyone who points out he's made an error), and attributes to them the very qualities that he despises the most in himself (cowardice, hypocrisy, ignorance) because when everyone is a coward, a hypocrite and ignorant then you stand above the crowd when you call them out, thereby fooling yourself into believing you're not a coward, a hypocrite or ignorant. My own pop-psych analysis matches that. Watts gets attention through pretence but is terrified of being found out so limits his interactions to people who won't, and won't even want to. It must be a horrible way to live. I like to think so, anyway. Watts is big in his own little pond, but of course AGW denial cult think the pond is much larger than it is. There are those swathes of scientists too cowed to speak out against the concensusistas, for instance: they read Watts every day, you know, it's a beacon in the Stalinist darkness of their lives. Some say it's all that keeps them going, or would if they weren't too cowed, that's been statistically proved by Richard Tol, oh yes. I hope they don't sleep either. Or ever experience another moment's joy. There, I've said it. He regards himself as a hero to thousands. Who in their right mind would boast about being a hero of deniers and conspiracy theorists?